New Music. New Jazz. Curated by John Zorn. The John Zorn Commissioning Series celebrates Zorn’s revolutionary venue, The Stone, a non-profit venue that was “dedicated to the experimental and avant-garde” and served as a vital spot for new music in Manhattan’s Alphabet City for over a decade. Held on the last Wednesday of every month, National Sawdust honors the spirit of the Stone, hosting the world premiere of new works. This month’s concert features trumpeter Peter Evans, who will present an evening of his own compositions for violin and piano — performed by Mazz Swift and Ron Stabinsky — as well as performing a solo piece on his iconic trumpet. 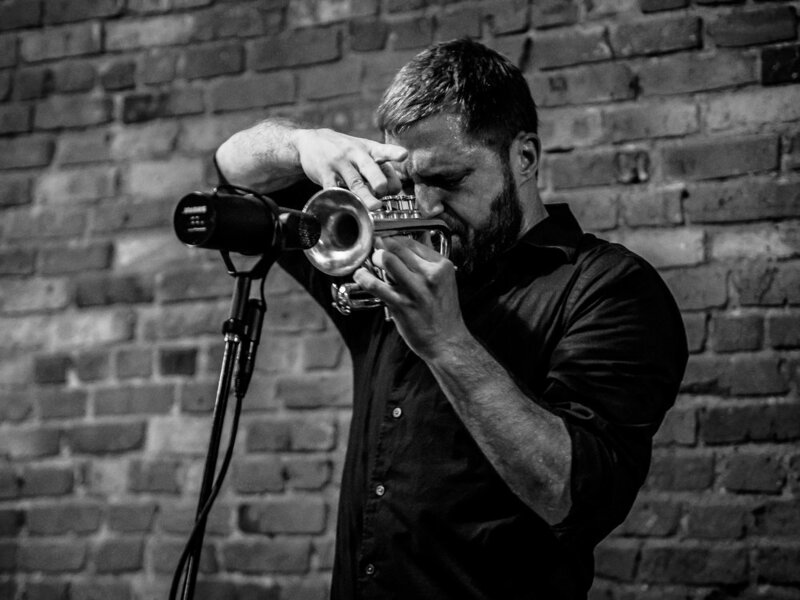 Peter Evans is a trumpet player and improvisor/composer based in New York City since 2003. Evans is part of a broad, hybridized scene of musical experimentation, and his work cuts across a wide range of modern musical practices and traditions. Peter is committed to the simultaneously self-determining and collaborative nature of musical improvisation as a compositional tool, and works with an ever-expanding group of musicians and composers in the creation of new music. His primary groups as a leader are the Peter Evans Ensemble and Being & Becoming. Evans has been exploring solo trumpet music since 2002 and is widely recognized as a leading voice in the field, having released several recordings over the past decade. He is a member of the cooperative groups Pulverize the Sound (with Mike Pride and Tim Dahl) and Rocket Science (with Evan Parker, Craig Taborn and Sam Pluta), and is constantly experimenting and forming new configurations with like–minded players. As a composer, he has been commissioned by the International Contemporary Ensemble, Yarn/Wire, the Donaueschinger Musiktage, the Jerome Foundation’s Emerging Artist Program, and the Doris Duke Foundation. Evans has presented and/or performed his works at major festivals worldwide and tours his own groups extensively. He has worked with some of the leading figures in new music: John Zorn, Ingrid Laubrock, Jim Black, Weasel Walter, Ambrose Akinmusire, Matana Roberts, Tyshawn Sorey, Levy Lorenzo, Nate Wooley, Steven Schick, Mary Halvorson, and Joe McPhee, and he performs with both ICE and the Wet Ink Ensemble. He has been releasing recordings on his own label, More is More, since 2011. 2018 will see the release of a new solo album, the first duo album with Levy Lorenzo, a new record by Pulverize the Sound, and a new album by the Peter Evans Ensemble. As a solo performer and bandleader, Violin/Vox/Freestyle Composition artist Mazz Swift is critically acclaimed as one of America‘s most talented and versatile performers today, and engages audiences worldwide with her signature weaving of composition and improvisation called MazzMuse. She is a proud performing member of Yo-Yo Ma’s Silkroad Ensemble, as well as with the Jersey City based chamber music organization Con Vivo Music. Mazz’s collaborative string trio HEAR in NOW (together with Tomeka Reid on cello and Silvia Bolognesi on the doublebass) was awarded the 2018 Chamber Music America Residency Partnership Program grant, and as such were featured artists in Philadelphia’s October Revolution Festival. Ms. Swift has performed and taught workshops in free improvisation on six continents, most notably having traveled to Suriname, Mozambique, Côte d’Ivoire, Ghana, Cameroon, Senegal, Albania and Siberia as culturalambassador at the invitation of the United States Department of State. She is currently working on her first solo CD, Modern Day Protest Songs.